beAbout a birthday, a recipe, a blog and a book. 1. Update this blog, regularly.. hopefully. 2. Bake a carrot cake, one that I haven’t done for a long time. 3. Share a new recipe. I had just finished a new book. Not a birthday present, but coincidentally, it arrived on the eve of my birthday. Was supposed to receive it wayyy earlier, 3 months ago. And Allah, He works in mysterious ways. And here is the book, as a birthday present. Thank you to Jemari Seni and Ika Madera for taking the time to post it to me, again. Why is this book special? And the writer picked my carrot cake recipe (which i picked from YouTube) of all there are in the whole wide web.. to be printed in this book. 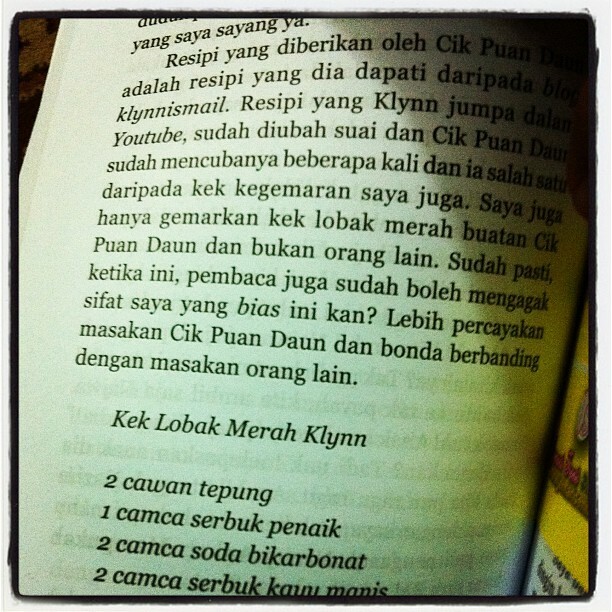 (Tapi jadi sedikit berminyak.. which, kalau ikut recipe asal youtube tu mmg ye pon). Wow, I am that special.. heheheh. (ok, dah berenti berangan.. bukan special pun). disclaimer di sini: saya tak kenal penulis ni sebelum buku ini. saya takde pun pujuk² dia tulis pasal blog saya. tak pernah bercakap, apatah lagi berjumpa. eh tengok gambar pun tak pernah. sbb tu lah rasa special.. bila dia pilih saya..
oklah, blog/resipi dalam blog saya. didAt first, I wasn’t too interested in reading. Just wanted to check out that page where Klynnismail is mentioned. But I started anyway at page 1. Which wasn’t quite appealing.. and continued and on and on. And I couldn’t put it down and the last page took me by surprise. The writer, mentioned my name and thanked me, which I didn’t really do anything. It was so sweet of you, Ika Madera. I am so touched. This is definitely a memorable birthday. Now about the book, lain kalilah review. (Sbb banyak nak cakap). In short, kadang-kadang rasa tersentuh. Kalau tak sabar, belilah.. tak mahal langsung. RM18 je!